Nifty Bounced 650 Point From Recent low of 6826 in 4 days. thats exact frm 200 Weekly SMA. So Now Today we closed at 7476 spot. Now the Question is This rally is Freak Bounce or we done the bottom-out. Lets Analysed With Technical Analysis. 1. As of Now We are Holding 200 Weekly Sma thats good sign for bulls. 2. But In daily Chart we are trading below 200SMA. thats not a good sign. Golden Rule: #When stocks/Index are Trading Below 200SMA No Low is good enough. Ex. Justdial Broke 200SMA around 1450 Now made low 375. Kaveriseed 872 to 320, SBI 280 to 150, PNB 190 to 70. many more. 3.So what is Current Value of 200SMA Nifty. its 7953. And 7979-73 is Trend-line Resistance Zone too. So Close above 7980. So Close Above 200SMA & Last Swing High 7979 Only We Can Expect That Nifty Will Bottom-out. i)We will Above 200SMA In Both Daily & weekly Time-Frame. ii) Start of Higher-High Formation. iii) Breakout From Falling Channel. 4. Now Next Question comes in a mind is what if we will fail to cross & Close above 7979.Answer is So again expect a Fall & Test of 6850 and Close Below 6850 or 200WSMA Target 6666-6363. So 6850-7979 is Range & Truth is we are Trading in falling channel. So DownTrend for Nifty. So Now Lets Talk about Current Scenario. 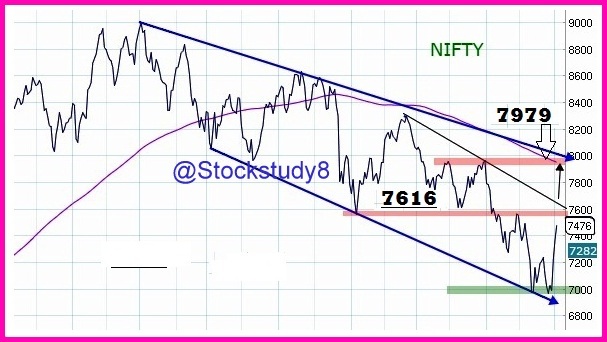 Going Forward 7575-7615 is strong resistance zone & 7245-35 is Strong support zone. If we Closed Above 7615 Then Next Target 7878. Due to Positive Div in daily We can test of 200SMA. or 7878 .Confirmation only above 7615. Hope you Like this articles. Share it Bindass.